Bathwraps has been the premier source for complete bathroom remodeling since 1991, offering some of the shortest lead times in the industry for quick turnarounds and high quality. Your bathroom should be a sanctuary, a place to get ready in peace in the morning and retreat to at the end of a long day. Having a functional, comfortable and luxurious space for yourself is key in reducing stress. Whether you have limited mobility or just want a whole new look for your bathroom, Bathwraps is one of the fastest growing acrylic manufacturers in the industry. 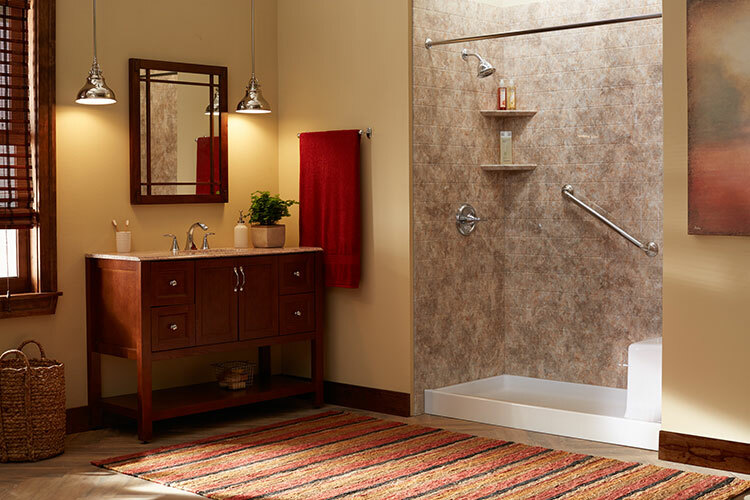 Turn to us for beautiful bath and shower systems made with 100% American-made non-porous acrylic that’s mold and mildew resistant, backed by a full warranty guaranteeing that our products won’t crack, fade, or peel over time. In fact, the Bathwraps Lifetime Guarantee covers your Bathwraps application for the life of your house. Our individually manufactured tubs and showers ensure a perfect fit with no messy construction projects that take weeks to complete. We have a variety of colors and patterns to choose from, along with built-in accessories, such as grab bars, caddies, pedestals and shelves. It’s time you invested in quality work and superior service with the best bathroom remodeling professionals around. For a free quote on bathroom remodeling from Bathwraps, feel free to contact us anytime for additional information.